No Known Motive for the Crime and no Clue to The Murderer. 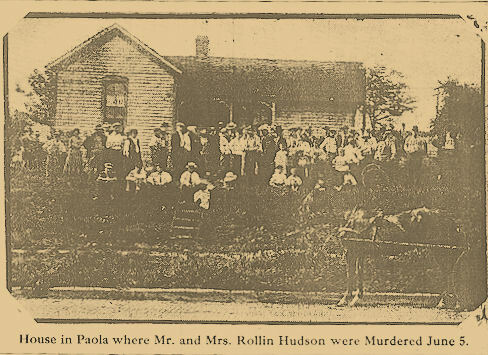 most fiendish murder ever committed in Miami Co. About 4 o'clock the bodies of Rollin D.
Stump and Mrs. William Pryor, neighbors of the murdered couple. Not seeing either Mr.
driving by in his buggy and the women told him of their suspicion. With Fred Hogan, Mr.
on the covers over their heads and where it had soaked through and run on the floor. the bodies taken to Johnson's undertaking rooms, which was done about dark. indicated that Mrs. Hudson was a neat, careful housekeeper. Mrs. Geo. W. Coe, who live on the opposite side of the street, knew Mr. Hudson a year. their house both months in advance and were well spoken of by the neighbors. wife on that day, and he left, going to Beagle, where he worked on the section two days. their home, led to the discovery of the murder. robbery, as they had nothing to be robbed of. but he did not show up again. caught his wife with another man three times. said: "How could you go and leave me this way." Hudson said: "You have not treated me right, Anna." apparently happy. The husband was singing and all differences appeared to be settled. Canton, Ohio, and Mrs. Hudson's parents, Mr. and Mrs. Jacob Axxe, live at Massillon, Ohio. They were married at Massillon on April 10, 1910, and after a time did not get along well. absence, his wife worked as a housemaid and Mr. Hudson spoke well of her. J. T. Logan and Wm. A Wilgue. several brothers and sisters at Massillon and other relatives at Ashland, Ohio. detectives were here and were now at work on the case.